• Custom Hardwood Stairs in: Oak, Poplar, Cherry, Mahogany, Brazilian Cherry, Walnut, and other exotic and domestic hardwoods. • Staircases can have any combination of wood, metal, and glass. 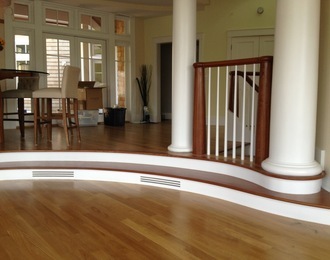 • Full hardwood treads in just about any hardwood. 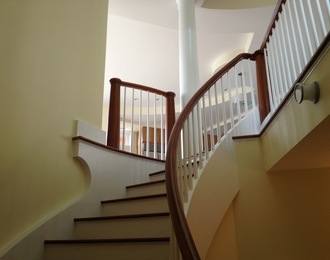 Curved, straight, and bowed steps. • Free standing staircase installation straight and curved or any combination of the two. • Installations done by our professional installers. 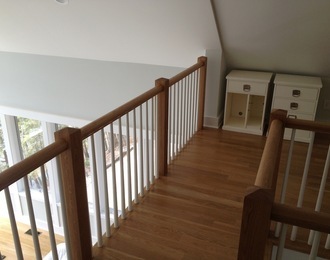 We provide free estimates for both new construction and remodeling projects. Please call our office or contact us for additional information. Feel free to email blueprints and/or photos of the existing rails, along with a description of the work to be quoted, and we will gladly put preliminary pricing together for you.